Science Week: Could yetis exist? 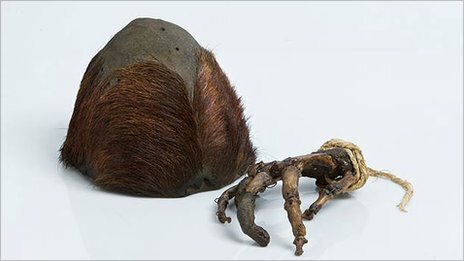 A pilot from New Zealand is in Nepal to return a replica of what some believe is the hand of a yeti to a remote monastery in the Everest region. Mike Allsop will fly from Kathmandu to the Everest region on Friday to take the models to Pangboche Monastery, which sits at 4,000m (13,123ft). The originals were stolen from the monastery in the 1990s. They first came to light in the 1950s when an expedition to find the mythical yeti came upon the monastery. Mr Allsop will also take with him a replica of a yeti skull-cap, which was also stolen in the 1990s. "I will take these replicas back to the monks so they can replace the ones that were stolen," Mr Allsop told the BBC. 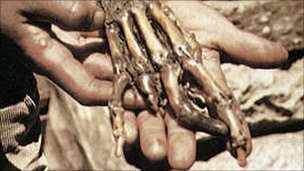 Peter Byrne, the leader of the 1950s expedition to find the abominable snowman, said that while the skull was probably made of goat or antelope skin, the hand did not match the skeleton of a human or a primate. Mr Byrne managed to take one of the bones from the hand out of Nepal to his friend, the Hollywood actor James Stewart, who was on holiday at the time with his wife in Calcutta. James Stewart's wife then placed the bone in her lingerie box and smuggled it into England where it was examined by a professor at Oxford University who said he could not conclusively say what kind of bone it was. In the 1990s, an American television channel ran a documentary about the hand and skull. Shortly after, both were stolen from the monastery. Mr Allsop said that he decided to make replicas of the hand and skull after trekking in the Everest region. He approached the head of the New Zealand firm Weta Workshop, who were responsible for crafting the special effects and props for the Lord of the Rings films. They agreed to make the replicas for free from photographs. Mr Allsop has not yet told the monks in the monastery that he is returning with replicas of the hand and the skull. He hopes that they will now be able to attract more trekkers to Pangboche, who will pay a small fee to see the artefacts. "I want to help the monastery have an income again - I want to help them out," he said.